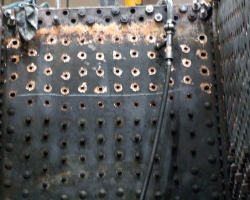 In the boiler shop, the lower repair section to the throat plate has had the holes to rivets and stays drilled and has been welded into place. 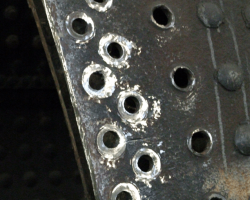 Inside the firebox, the stay holes for this section have been cleaned and await the stays’ fitment. 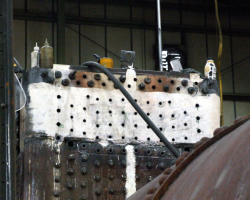 DSCF0978	At the rear of the firebox, the vertical rows of rivet holes have been likewise cleaned up ready for the backplate to be fitted. 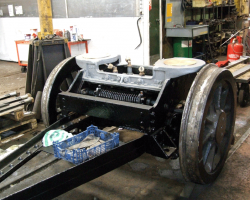 Further work on the pony truck has seen the top slide, still in grey primer, fully installed, and the guard irons ahead of the wheels are bolted on. Apart from finish painting, the truck needs only its bearing springs and hangers for it to be complete. 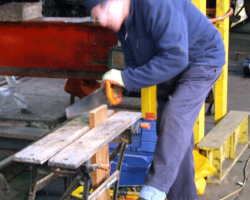 Meanwhile, work continues on the cab floorboards. Sawdust makes a bit of a change from the usual steel swarf! 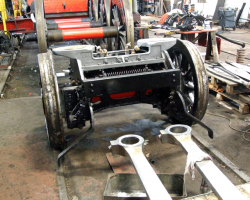 Although there is little work left to complete the tender, the water valves need to be attached to their operating handles and the handbrake column refitted and the linkage connected. 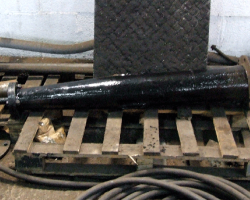 The first stage of this was the assembly of the column; a little work needs to be done on the tender before it can be fitted.